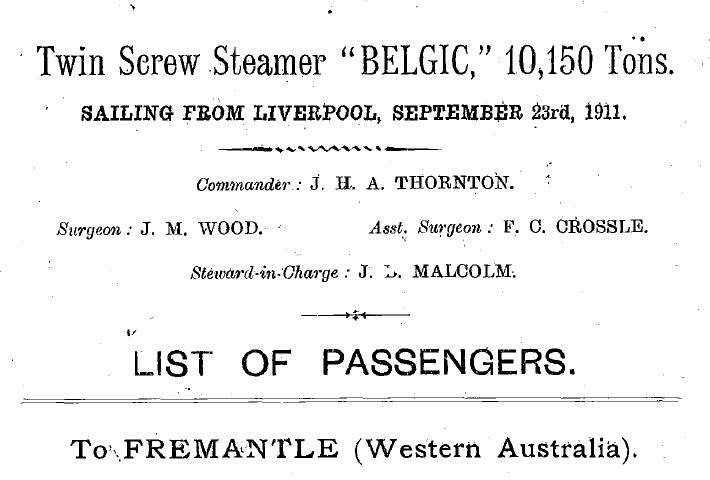 Some years ago WAGS Library was given an original Passenger List for the TSS Belgic, one of those been given to all passengers travelling on board the ship. The ship sailed from Liverpool on September 23, 1911 and arrived at Fremantle on November 11, 1911. There were 925 passengers on board for Fremantle and others bound for Adelaide (252), Melbourne (203) and Sydney (168) giving a total of 1,548 which included some new immigrants. The person who donated the document to WAGS is unrecorded, but they had obviously had some connection with the ship as there are some pencil markings on the document which may indicate their interest. Part one of the story of the Belgic is now on the WAGS Blog, along with the passenger list in a searchable flip book.